High-quality marine VSAT terminal deployments are being facilitated through the collaboration of three leading industry organizations on a global online training program. The Global VSAT Forum (GVF), Sea Tel, and SatProf have announced that they will jointly launch a web-based training platform at www.gvf.org/training that enables faster, more cost-effective delivery of operation and installation training for personnel who either utilize or deploy Sea Tel marine VSAT terminals. Sea Tel Inc. of Concord, California, part of Cobham Antenna Systems, and GVF of London, U.K., entered into an agreement to produce on-line Marine VSAT Operation and Installation training courses specifically prepared for Sea Tel’s ’09/’10 series 3-axis marine stabilized VSAT terminal operations and installations. The new on-line courses, which are a complement to GVF’s existing online Satcom Professional Certification training, were prepared by and are hosted by SatProf, Inc., of Huntington Beach, California. The courses feature engineering-accurate tutorials and exercises, including 3-D, interactive simulators. 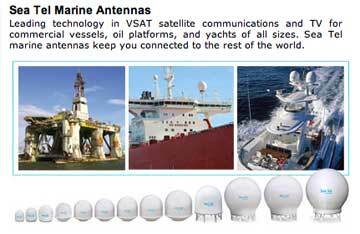 The VSAT industry relies on a certified installation force for customer satisfaction and prevention of RF interference. All Certified Marine Satcom Professionals are automatically eligible to be listed in the GVF Certified Satcom Professional Database. The Sea Tel operator course series list price is $275 per student and the installation and maintenance course for field engineers is $725 per student; please contact Sea Tel to learn more about these courses. You can also contact GVF for quantity discounts, developing country discounts, and distributorship license agreements. GVF is the non-profit association of the satellite communications industry. The organization has been actively developing and providing education and training programs for satellite communications professionals. The addition of Sea Tel training to GVF’s program comes at a time when satellite communications services are being delivered at unprecedented levels, both in developed and developing nations. The Sea Tel and GVF training aims to ensure that the higher volume of installations is conducted with the highest possible level of technical competency. The Sea Tel training module is a complement to the GVF VSAT Installation & Maintenance Training Course, which is the global industry standard for training installers of bi-directional satellite earth stations. It was created by a consensus of volunteers serving in the GVF Education & Training Working Group (E&TWG), whose mission is to identify, formulate and share knowledge that is beneficial to the VSAT industry, its shareholders and stakeholders.